The following schools offer Expressive Arts Facilitation training. Some offer certificates and some do not. Some are online, some are not. Please contact each school to find out more information, and check with the International Expressive Arts Therapy Association to see if the program of your choice contributes toward a REACE designation. 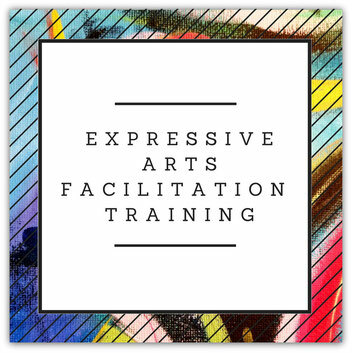 Expressive Arts Florida - Certificate Training Program in Intermodal Expressive Arts. Expressive Arts Florida Institute is a two-level Certificate Training program in intermodal expressive arts for those interested in pursuing the Expressive Arts as a professional path, whether integrating it into an existing career, or beginning a career in the expressive arts field. Prairie Institute of Expressive Arts Therapy - In Calgary, Alberta Canada, Carmen Richardson offers a 6 month intensive training in the fundamentals of expressive arts therapy. Students attend one weekend a month of training over 6 months. This program offers an introduction for individuals who may want to use the arts in their clinical practise, community work, or for personal experience. A degree is not required but an openness to experience the intermodal use of expressive arts. Expressive Arts Therapy | Appalachian State University - Appalachian's philosophy of expressive arts therapy is inextricably linked with the natural landscape. Set in the ancient mountains of the Southern Appalachian Range, among Native ancestors and remnants of the earth's oldest forests. Nature's cycles of creation, elaboration, destruction, and regeneration provide the model for creative process in art and life. Expressive Art Workshops - Offers online experiential immersion into the expressive arts for personal and professional development. Expressive Arts Foundations offers 40 hours of online experiential education for your REACE application process. The Institute for Creative Mindfulness - Mindful Ohio/The Institute for Creative Mindfulness & the program Dancing Mindfulness offers a comprehensive Certificate of Expressive Arts Therapy training program. Successful completion of this program can be used to fulfill educational requirements for IEATA credentialing as a Registered Expressive Arts Therapist (REAT) and may also be applicable towards the Registered Expressive Arts Consultant/Educator (REACE). The Creative Center - This program focuses on the role of the arts in healthcare and creative aging, providing theoretical and didactic approaches to implementing and sustaining high-quality arts programming in a variety of settings, serving people living with illness and older adults across the aging spectrum. Center for Creative Arts Therapy - The Center for Creative Arts Therapy's Training Programs offer coursework in the following professional disciplines: Drama Therapy, Expressive Arts Therapy, Therapeutic Performing Arts, Theatre of the Oppressed and Psychodrama. Society for the Arts in Dementia Care - The Society hosts workshops and conferences on Creative Expression, Communication and Dementia. Workshops and conferences are led around the world by Dr. Dalia Gottlieb Tanaka. TimeSlips - Offers online certification in creative storytelling technique that teaches the meaning and value of creative engagement, an introduction to dementia and person-centered care, improvisational storytelling in detail, and models for storytelling projects. Soul Collage - Originated by Seena Frost, SoulCollage® is a process for accessing your intuition and creating an incredible deck of cards with deep personal meaning that will help you with life's questions and transitions. Person Centred Expressive Arts Institute - PCEA was founded by Dr. Natalie Rogers and is based on her father Carl Rogers’ person-centered approach and her Creative Connection® process. The Person-Centered Expressive Arts Institute offers a two-year PCEAT Certificate training program in collaboration with Meridian University. Expressive Trauma Integration - Expressive Trauma Integration (ETI) is a multidisciplinary approach to trauma interventions based on over a decade of research and clinical work with traumatized populations in the Middle East, United States, Africa, and Asia by Dr. Odelya Gertel Kraybill, a trauma therapist, and consultant. Salve Regina University Expressive Arts Institute - In addition to the graduate coursework, a non-credit professional development course is offered annually in the summer session. The Expressive Arts Institute (EAI) is a three-weekend workshop that provides artists, counselors, educators and those in related fields with foundational training in the expressive and creative arts. Wild Heart Expressive Arts Teacher Training Program - If you are you are a spiritually and psychologically inspired coach, trainer, counselor, artist or healer, if you are passionate about art and creativity and longing to develop your own fulfilling expressive arts workshops this program, can help you create what you envision. Creatively Fit with Whitney Freya - Whether you choose to guide your clients & friends through Vision Quest, The Creatively Fit Program, The Super Soul Flow Meditation Course or teach your own art workshops, serve your life coaching clients, or inspire any other community, the Creatively Fit Coaching Certification Program is your opportunity to create income from your heART! Institute for Therapy through the Arts in Evanston, IL. Offering four creative arts treatment modalities – Music Therapy, Drama Therapy, Art Therapy, and Dance/Movement Therapy, the institute sees individual and group clients, and also engages in training and advocacy. Creative Response Therapy - CRT™ provides user friendly and accessible multi-media instruction and guidance to teachers, caregivers, therapists, coaches and researchers in education, treatment and corporate settings in both in-person and online training. View the intro video HERE. Langara Expressive Arts Therapy Certificate Program - an integrative arts-based psychotherapy training program with an emphasis on theatre, drama, movement, visual arts, and creative writing. Established in 2004, the program is the first of its kind in British Columbia, Canada. JFK University at Berkeley offers a Master's in EXA (and a certificate in Trauma interventions.) The Master of Arts degree in Counseling Psychology – Specialization in Expressive Arts prepares students for careers as psychotherapists with a special emphasis on multi-modal expressive arts approaches to psychotherapy. KATI Art Therapy Distance Program teaches an Indigenous method of art therapy practice with a focus on community-building and experiential course work. The initial immersion is followed by online course work and the development of community and clinical art therapy placements. Arts Health and Creativity at the University of Tasmania offers a short online course exploring arts practices and creativity in healthcare. This course provides you with an introduction to the broad field of arts/health research and the application of arts practices in the clinical and expressive therapies, and community and personal health settings. Live Your Art Studio - Expressive Arts Therapist Yvette Lyons (North County, San Diego) offers certification in the Expressive Arts, Mari Mandala Training, and Sand Tray Therapy to people who want to work in the mental health field. Bergin Learning Arts - School of Expressive Arts in Portland Oregon offers a 500-hour Embodied Expressive Arts training program. Participants learn about movement-based expressive arts through their bodies – physically, psychologically, and emotionally. St. Xavier College in Mumbai, India offers an intensive post-graduate diploma program in expressive arts therapy. Arts in Health Institute offers accessible and affordable online education in their approach to health and well-being with arts engagement training and advocacy.